The Aranui 5 is 126 metres long or about 413 feet. The harbour of Vaipaee on the island of Ua Huka is about 50 metres wider than Aranui is long. Docking a ship in these conditions is not for the faint of heart. 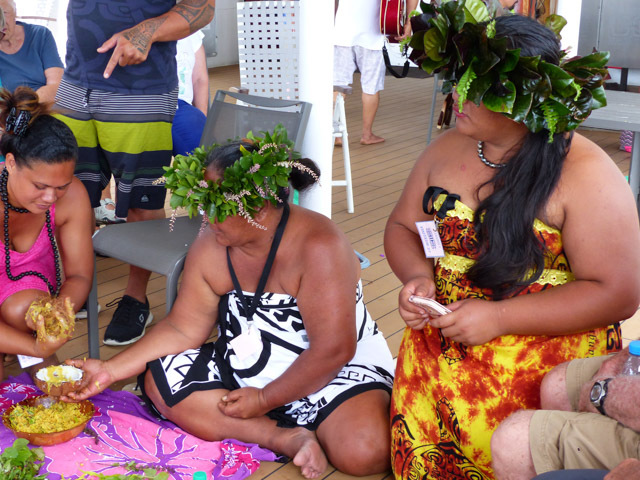 The Aranui crew put on a complete spectacle for us, bringing their best game to dock in Vaipaee. Heading into the narrow bay, Aranui drops the anchor then pivots 180 degrees bringing the stern into place. 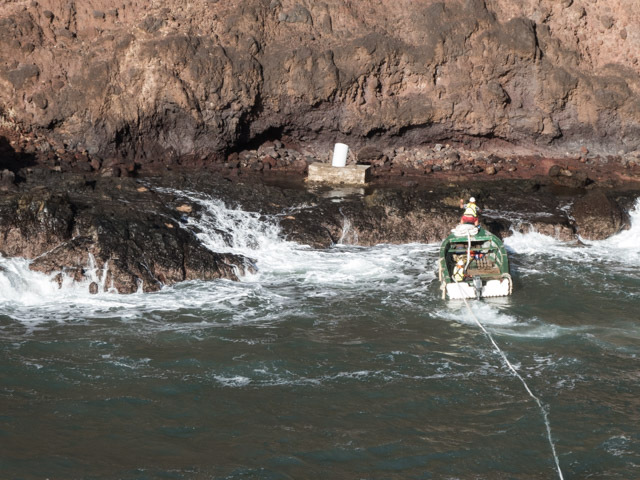 The barge is in place and the long boats with the shore crew are in the water, taking the stern lines to the headlands either side of the bay. The waves are substantial enough that the men might take more than one attempt to jump ashore. Getting stern lines out has more to do with tying down a bucking bronco than a tying into a dock. Disembarking the passengers is equally exciting. (No photos because of the roughness.) 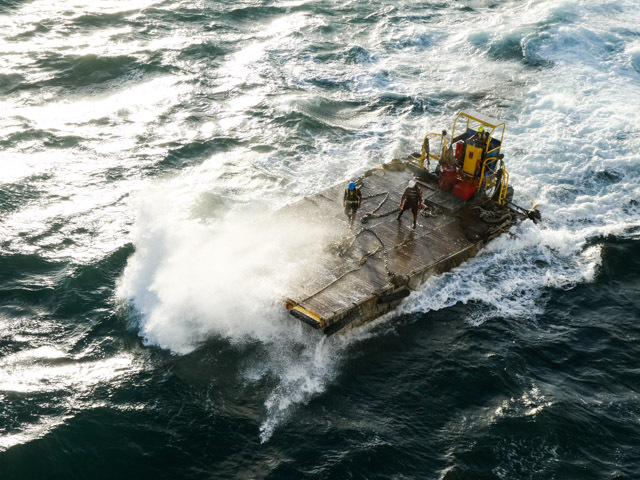 We were wearing wet shoes today because as you walk downstairs to the passenger barge, the water is spilling in up to your knees and the crew are lifting you in. Trust is the word. You stand in front of four or five muscular men who are gauging the thrust of the barge and waiting for the entrance to the barge to line up with the entrance of the ship. All you can do is trust them to get you on the barge intact and sit down immediately once you are on this bucking bronco. Oh, and keep your arms and hands inside the barge. This is an adrenalin start to your morning. We go to a food producing Botanical Gardens and see orchards of citrus and breadfruit. We hear about native trees and also about how much food can be produced on the islands. Some items may have been introduced thousands of years ago with the first visitors. The 4 x 4’s then take us to the Handicraft centre and Sea Museum in Hane Village. The models are rustically exquisite and the carvings are intricate. After lunch, we hiked up to a meeting point and our guide told us the history of the people here. The views were spectacular over the coast. Ua Huka has miles of winding road, which you can see hugging the coastline. What you don’t see are the wild horses and goats that are often near the road. The goats are wild and harvested by locals for milk or meat. They are not indigenous animals but the locals are happy for the food source. Since the Aranui is the main avenue for supplies to arrive on the island, having a ready supply of dairy and meat seems more than reasonable. I had one favourite view which I found just splendid and reminiscent of the California coastline. 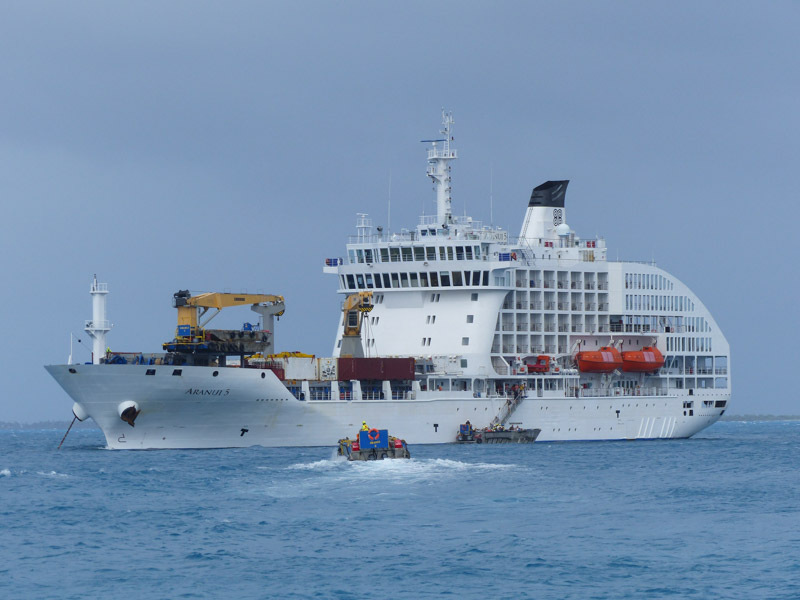 Last photo, of the bargemen negotiating Aranui out of Vaipaee Bay. Discernible difference between Vaipaee Bay and Hokatu, isn’t there? The Tiki at the me’ae or marae in Puama’u were in a wild setting. Here you find the largest tiki in French Polynesia. Called Takaii you see a tiki that was taller than most about 8 feet high; a monument to a great king perhaps. 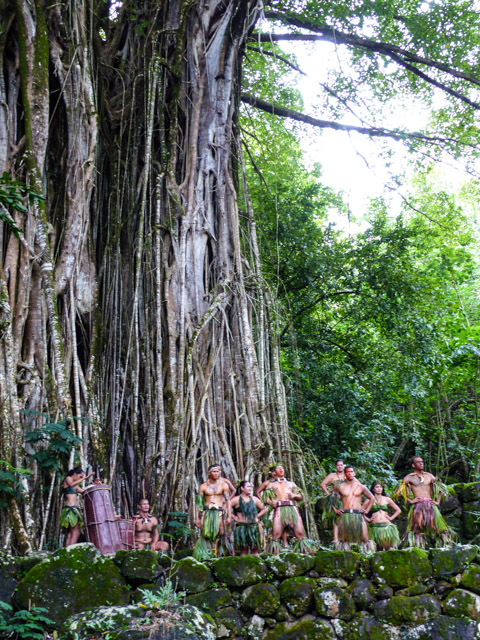 The tikis needed protection from the environment, so they are now under huts arranged by UNESCO. There is also a large stage that was used to kill enemies on a sacrificial altar. 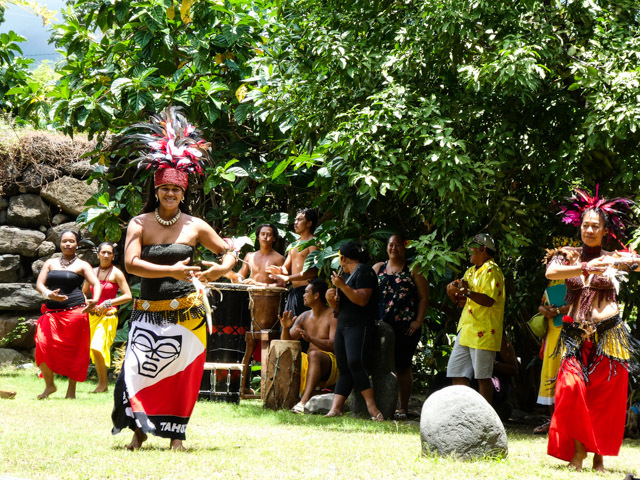 One of the tikis was of a well-loved queen, who died in childbirth and the tiki is a monument to tell her story and it became a place women could come and ask for help with their own pending births. 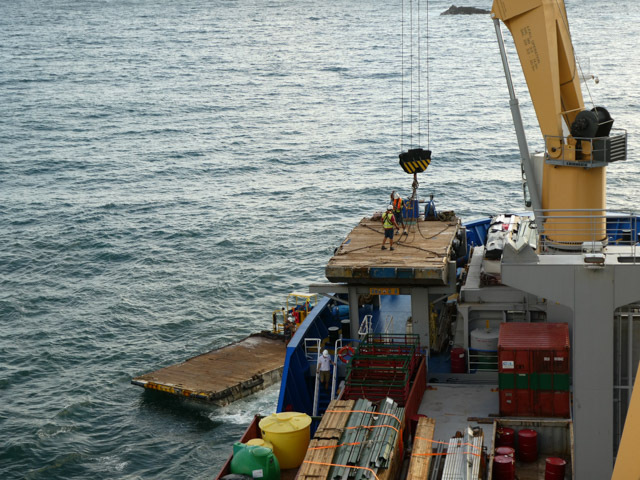 We returned to the ship, and were mesmerised yet again watching the Supercargo add the containers and reposition the barge, the fishing boat and the backhoes as if they were moving pencils and pens on a desk. We had lunch on board in a much calmer, Vaitahu Bay. Aranui often finds a lovely calm anchorage at meal times and even until the early morning hours so that we could get a good nights rest. 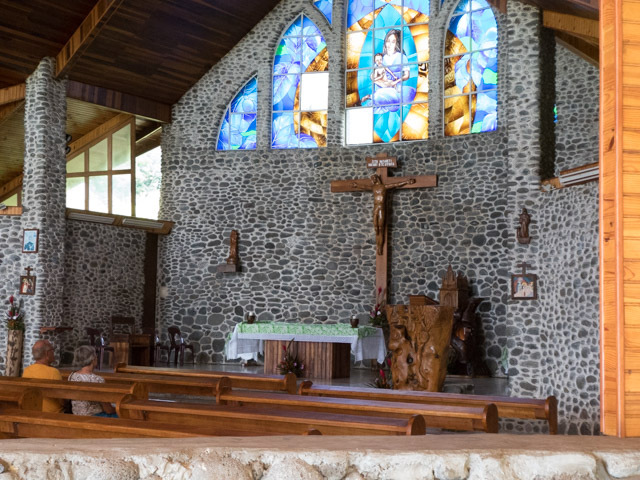 After lunch we went to a church built with an aesthetically pleasing reference to the Hiva Oa’s crafts and its environment. Sadly in a storm, they had lost two panels of the stained glass windows and I hope they are able to replace them. Notice the beautiful carving. 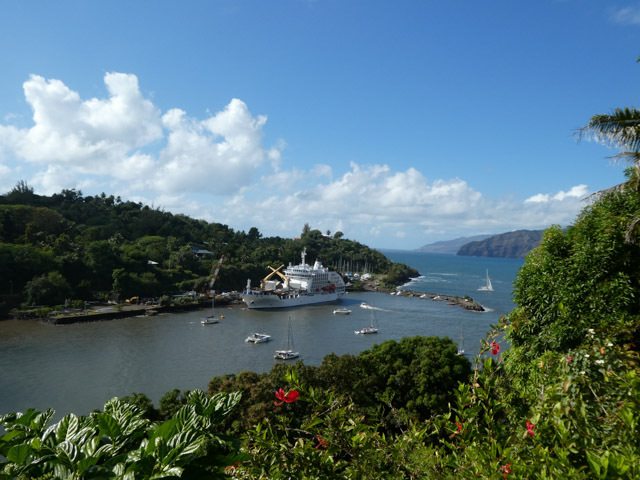 Tomorrow we are up early to watch the spectacular manoeuvre to anchor in the narrow harbour of Vaipaee. 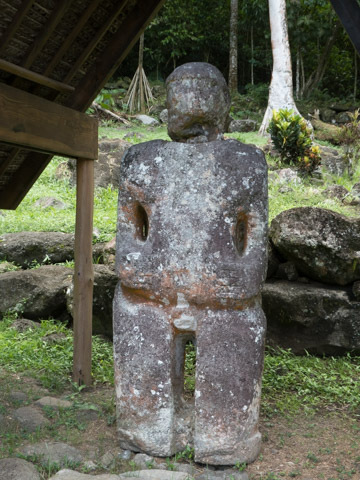 Fatu Hiva, famous for its visitors, like the Spanish explorer and navigator, Mendaña, circa 1595 and Thor Heyerdahl of Kon Tiki fame circa 1947. 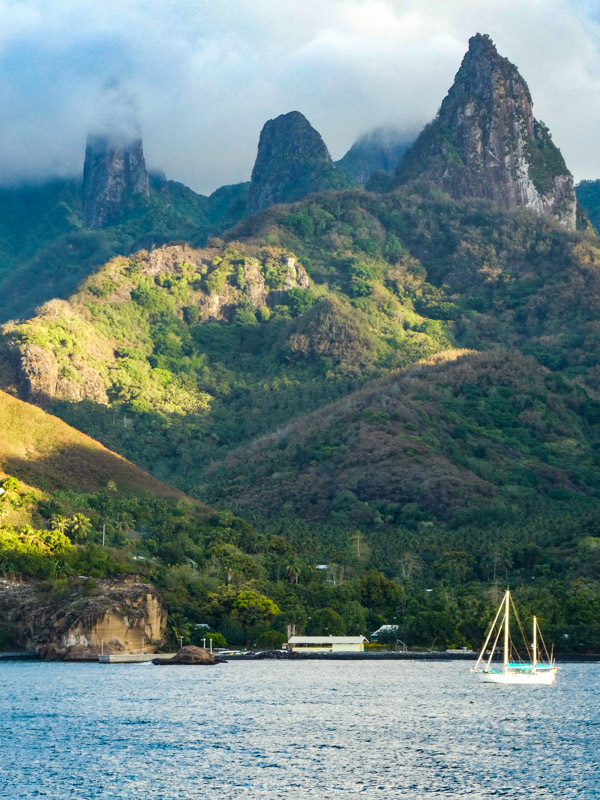 We feel like adventurers reaching Fatu Hiva, although we arrive in absolute luxury and comfort. 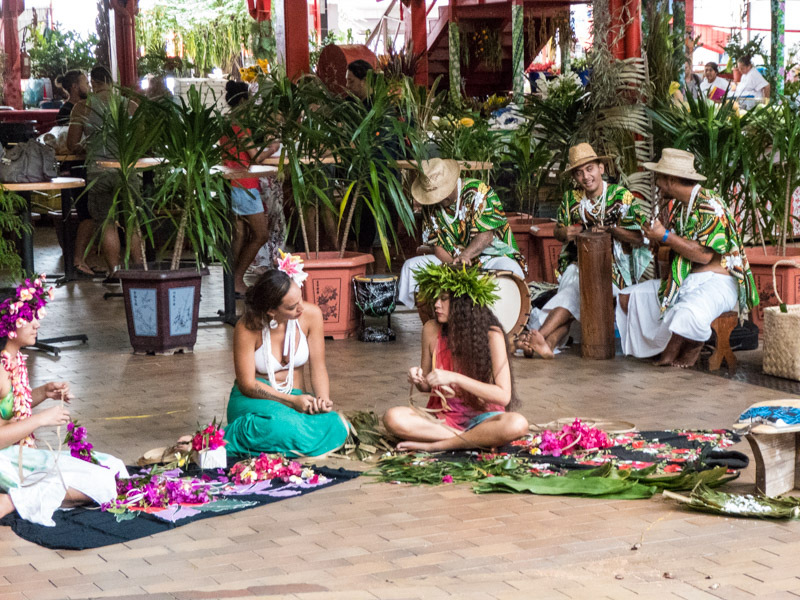 The evening before we arrive at Fatu Hiva, all talk is about handicrafts: making tapa, flower leis and crowns and monoi, a coconut oil for hair and body. We also hear about the beautiful flowers on the island. Mama’s of Hanavave making coconut oil on the Aranui. Admire their beautiful head wreaths. When we go to see the local handicrafts, we have a band playing music for us. The children would come right up to the band and play without worry. 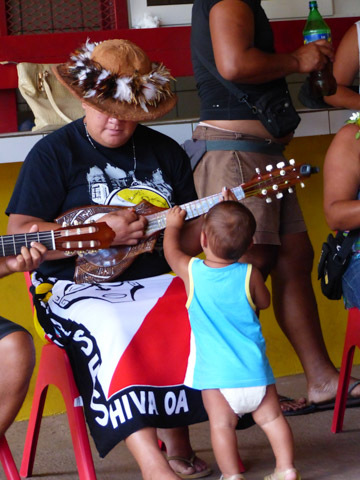 This young musician had a go of the drums and the ukulele. He was not worried about the crowd at all. Nearby a little girl about 9 months was trying to dance. The children are lovely, generous and simply gorgeous. You wouldn’t be able to get away with buying some beads or shells. They were offering us pamplemousse or sweet grapefruit to get us to have a look at their beads. In the afternoon, we went to the Bay of Virgins, before the priests arrived the Islanders called it the Bay of Phalluses or Baie des Verge. It went to Virgins just by adding an ‘i’. The Catholic priests were perhaps easier to live with than the Protestants. They made small changes (like adding an i), they didn’t destroy the tikis and were more understanding of the traditions. I am not comparing the religions or cultural imperatives, just noting the softer approach. The other topic of discussion on the way to Fatu Hiva was the ten mile hike. Where all the other hikes are highly advertised and recommended, the discussion of the ten mile hike is an exercise in dissuasion. 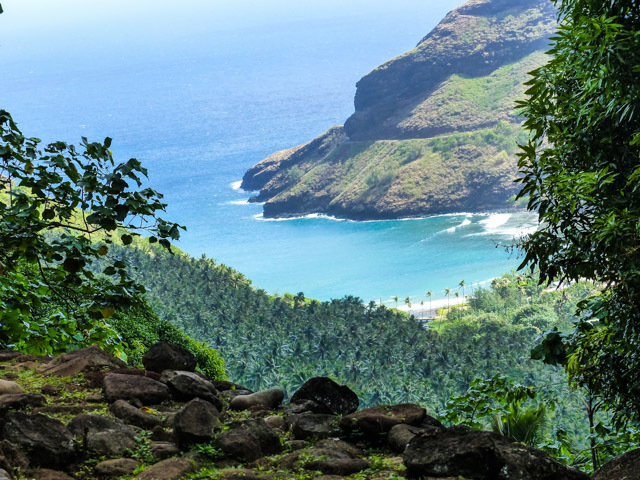 The hikes in the Marquesas are all uphill/downhill but the on Fatu Hiva, you walk up for half the hike, at the top it rains on you and you come down in mud and hellacious humidity. The hiker disembarked at 8:00 am but the hike didn’t start until 10:00am. That is one start time the Aranui guides should reconsider. Earlier would be better.Reading an Aranui blog citing a few hikers staying in bed for two days after the hike. I decided to give the 10 miler a miss, but now I wish I had trained for it. Tip: train for the hike, use hiking sticks to help control your decent in the rain and mud. Good shoes, insect repellent, sunscreen, a hat and water are a must. After all you want to see the beautiful flowers. Another dawn with the island of the Hiva Oa in the distance. The mornings are so magnificent; golden light on billowing clouds. Aranui is ready to negotiate a small harbour, with a very small and restricted docking, and several yachts anchored right in the way. The ships captain blasted the horn three times and we could see the yacht crews springing to life much earlier than they would have expected. The barge and the life boats were unloaded and went to help the hapless yachties reposition themselves. We were fully absorbed in watching the captain dock Aranui in this diminutive harbour. I was incredibly thankful that it wasn’t my yacht in the way of a ship in such close quarters. Here is a photo of Aranui, once she has docked. 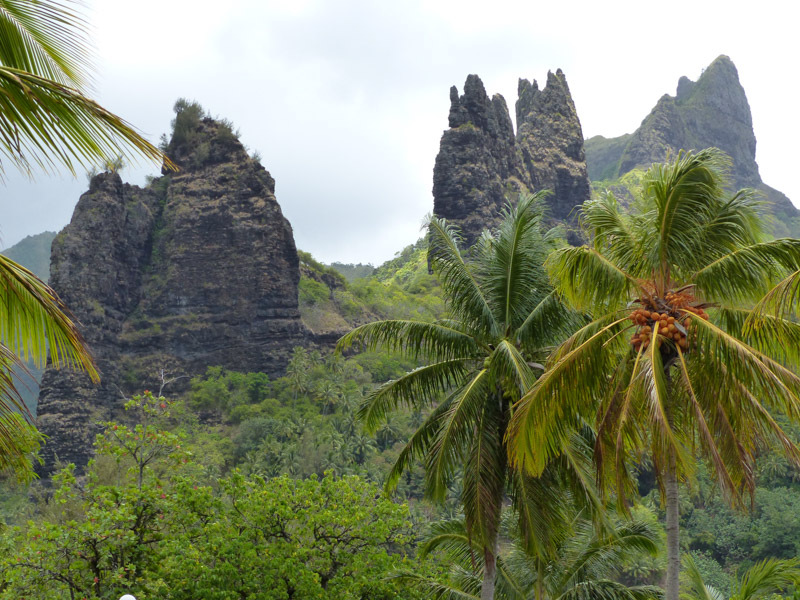 Hiva Oa is where Paul Gauguin spent the last two years of his life. We did the walk up to see the graveyard, where he was buried and then walked into the city to visit his last home and the Gauguin museum. We hiked directly up hill from the dock to the cemetery. Like so many cemeteries, it has the most beautiful view down the hill and over a harbour. 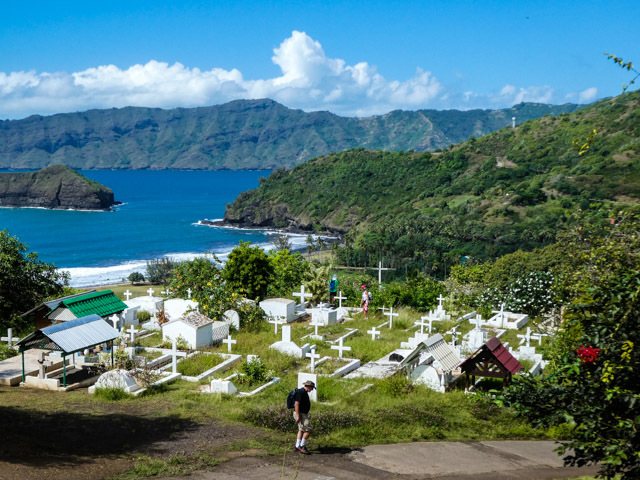 The cemetery at Hiva Oa. Gauguin was in trouble with the church and he was in ill health. Hiva Oa was his last refuge. Didier Benatar gave us quite a wonderful talk about Gauguin’s life, his troubles with the Church and the politicians too. 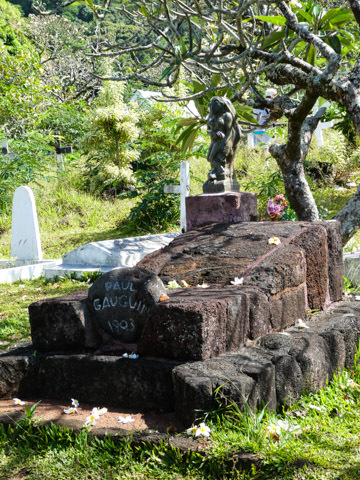 Even though the Church didn’t approve of Gauguin’s life style, they did bury him in the consecrated ground of Calvary Cemetery. More to better to keep an eye on him, than to grant him dispensation. The statue is not a Madonna but perhaps a copy of his ceramic, Oviri, a goddess of Wildness. Gauguin had visited Melbourne, Sydney and then Auckland and he was very taken with the Maori’s way of building their houses and when he came to Hiva Oa and sent some money he did build a whare whakairo. 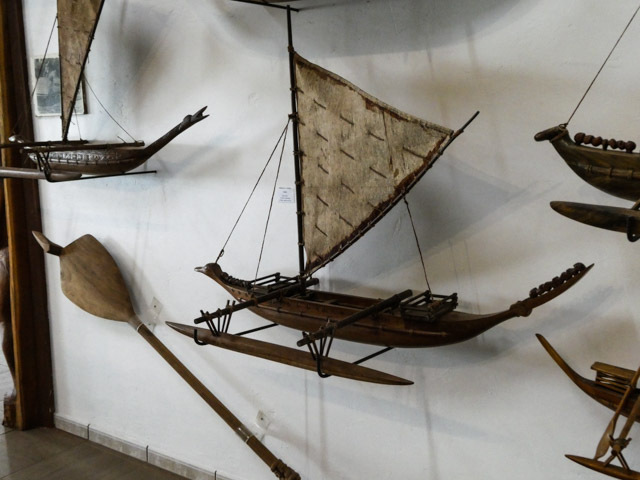 Today that is part of the Gauguin Museum on Hiva Oa. 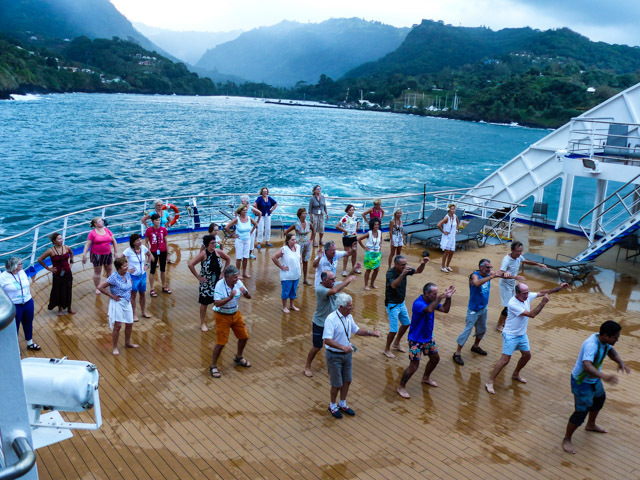 In this glorious setting, at sunset, we have a Tahitian dance class with the men learning a Haka and the women learning something more graceful. This isn’t your typical dance studio. Like a kid at Christmas, I would wake up before dawn if we were going to make landfall. There are other early birds on this trip, who we would join on deck 9 and we would watch with fascination the abilities of the men of the Supercargo. These men would initially be hoisted off the ship on a barge and life boats and approach the harbour to prepare for docking. They were able to handle all types of conditions. 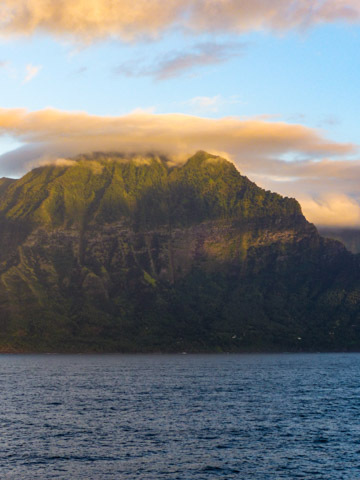 On Ua Pou, the Aranui goes into a small harbour with a smaller wharf. 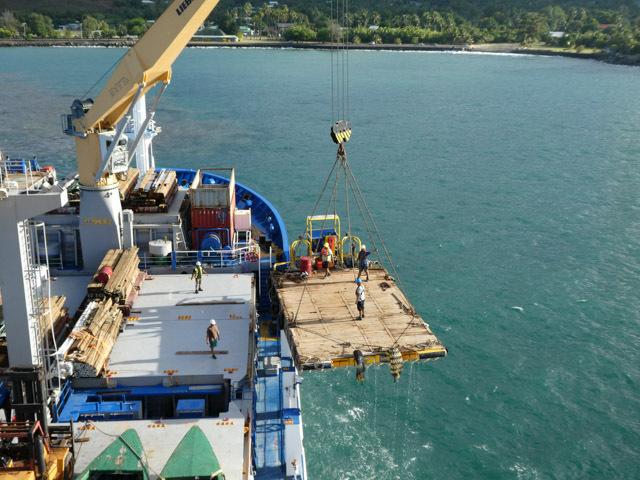 These men of the Supercargo are experienced in docking the Aranui with precision and speed. After breakfast, we left the boat and hiked to the white cross which overlooks the village of Hakahau. You can see Aranui in the lower right hand corner. 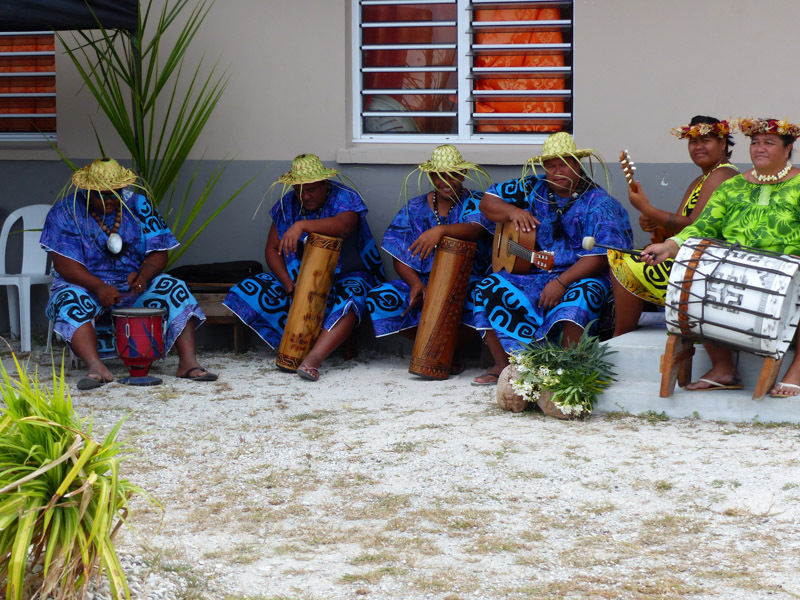 Almost every village we visited welcomed us with song and some with dance. 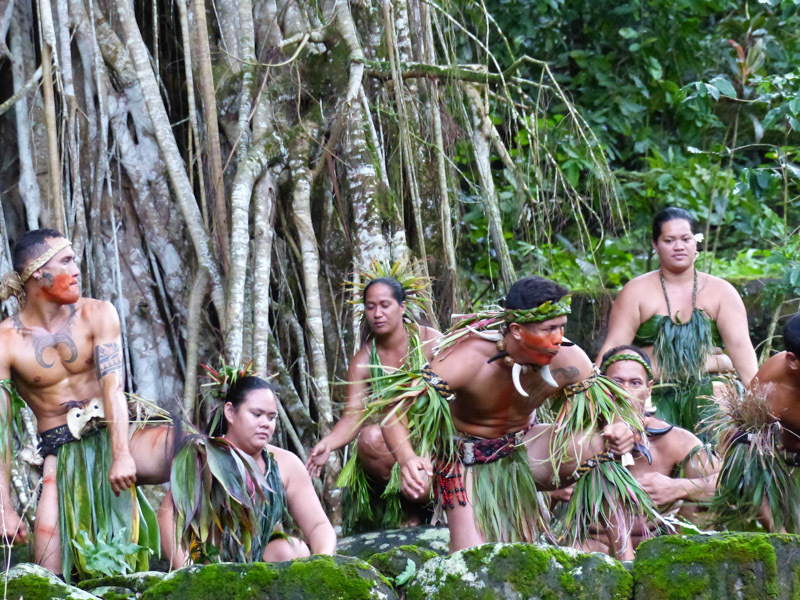 We hiked down and went to Pae Pae for a welcome dance and haka. The men did the haka and then jumped into the crowd. There was an abrupt intake of breath and a few people in the front row were heartily surprised. The dancing woman are more welcoming. 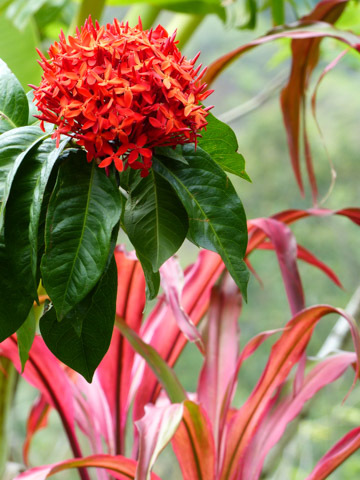 Ua Pou is famous for Flower Stone, spewed out by volcanoes with crystalline garnet flowers in the stone. We went to the cultural centre to find a hand carved Cailloux Fleuris or Flower stone. 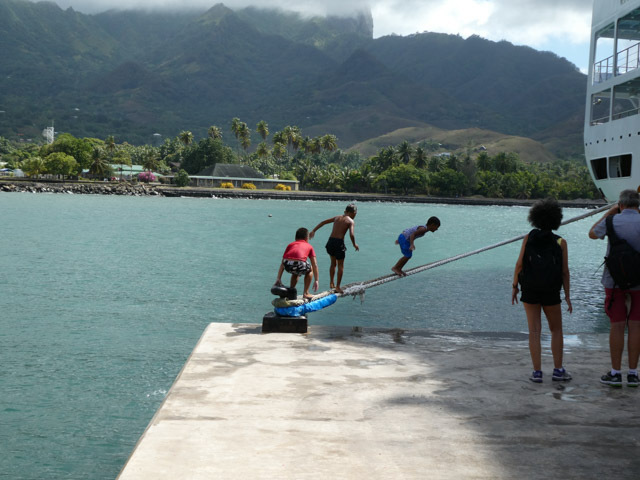 On the way back to the Aranui, we could see the children using the ship as a playground. They would dare each other to ‘walk the plank’ on the ropes and then jump in. 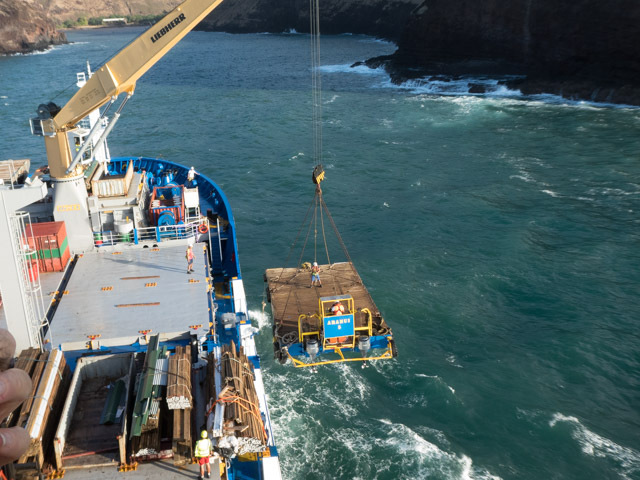 As the ships leaves the harbour, James spots a big stingray coming to the surface with the churn of sand from the harbour and once the Aranui is in place to leave Ua Pou, they bring the barge back onto the ship. loading the barge at the end of the day. 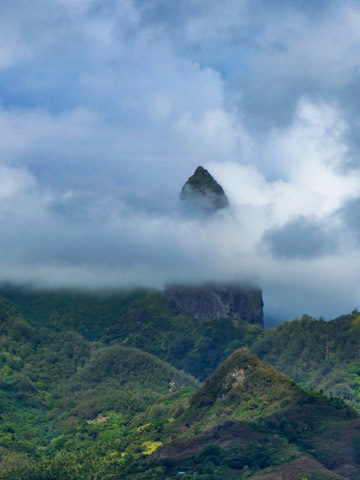 Ua Pou is also an island known for its majestic volcanic spires, which are often captured in cloud. We see this as we sail away. 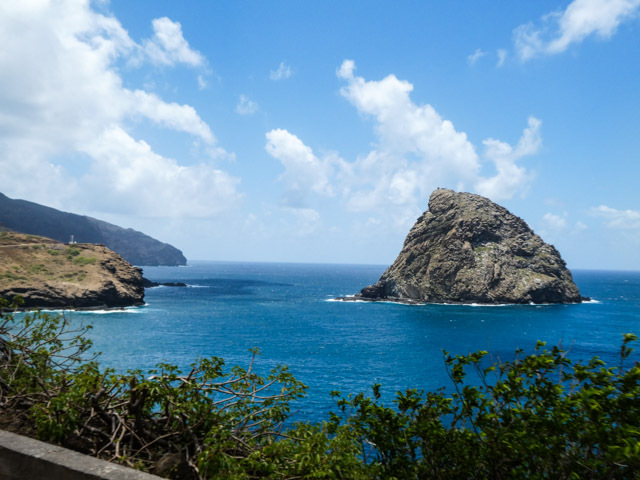 Day four finds us following into the footsteps of Herman Melville and Robert Louis Stephenson onto the island of Nuku Hiva and up to the to the magical banyan tree. 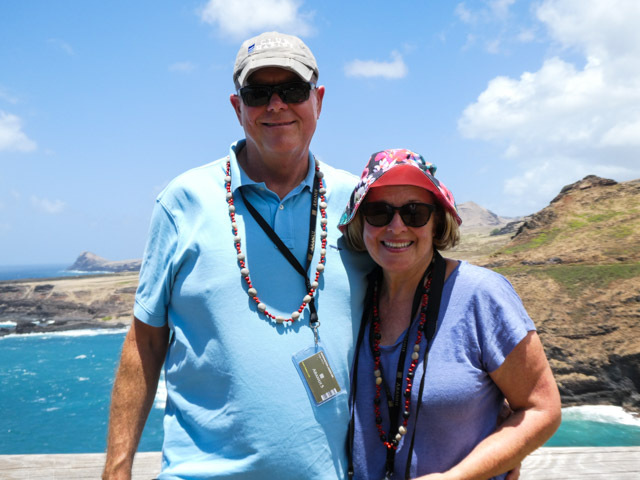 Nuku Hiva is 1400 kilometres north of Tahiti, so we have sailed for forty hours with plenty of time to enjoy Aranui, but now we have reached our own idyll. We are not in Kansas anymore! The tree we see was an ancient burial site, surrounded by human skulls of cannibalised victims. The drums and steady dirge of Ho, Ha, Hey, raised the hair on the back of my neck. These were warriors and their haka was meant to be a warning and if you didn’t heed them, you might have ended up here and then your skull would have been discovered about fifty years ago by archeologists. Marquesians are so friendly and they seem so happy there is no reason to fear being eaten by them. The fear should be reserved for the Nono’s. Seriously, it is the NoNo’s and mosquitoes that you have to worry about. We were dressed in long sleeves and long pants, covered in Deet and insect repellent and if you missed one spot, they would find it. 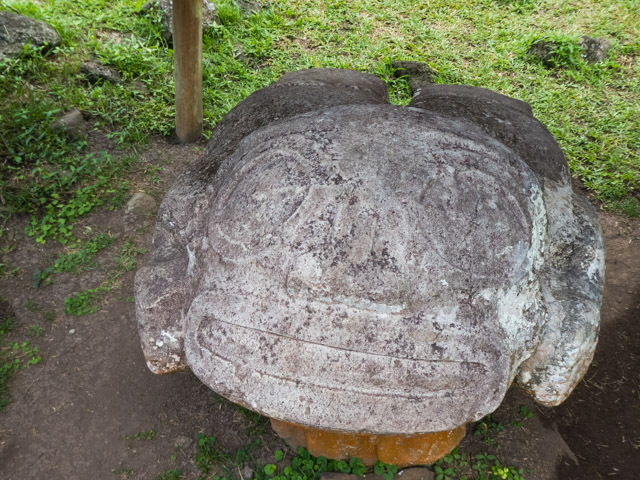 We saw people covered in welts as we walked up to the top of the hill, where there were tikis and an archeological site. We looked for petroglyphs but didn’t find them. The rain started falling through the leaves and the path was covered in serious mud. 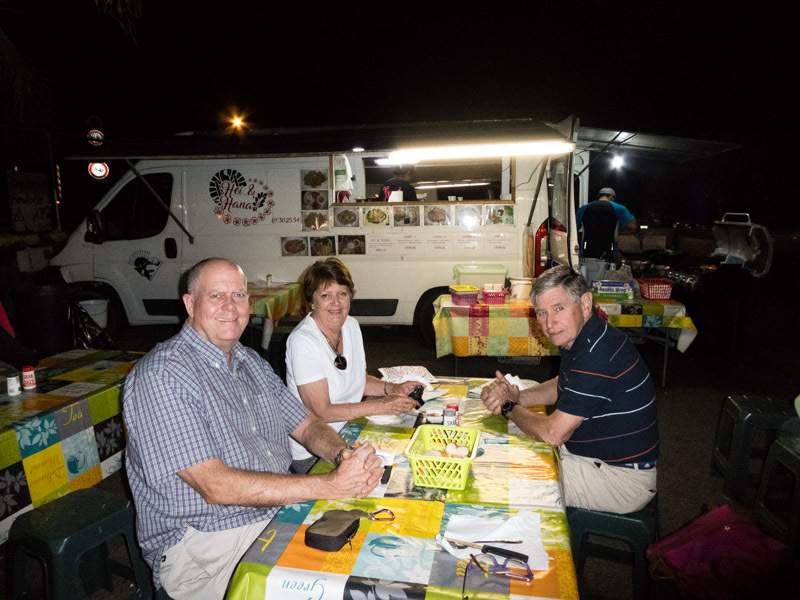 We made our way down to hill to our cars and onto the Tohua for our local banquet of poisson cru, goat, chicken, plantains and salads. The scenery is so different to the motus. The colour is different too, all shades of green. Verdant, lush and wild, you feel like you are on a movie set. 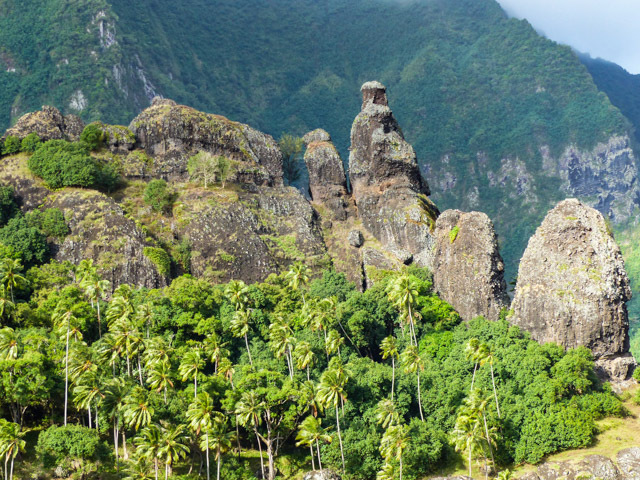 Nuku Hiva means ‘to assemble the roof’ and you do feel like you are on top of a volcano that is being subdued with primitive greenness. Tips: Use an insect repellent, spray yourself, spray your clothes, once dressed spray your shoes and socks. 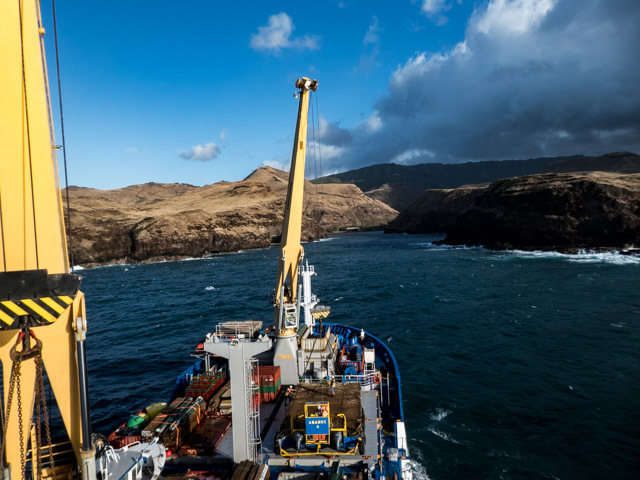 My sister asked “what in the world is a hybrid freighter cruiser?” Our ship is the Aranui 5 and it takes 200+ passengers and quite a bit of freight to the remote Marquesas Islands. Besides travellers it delivers everything from vehicles such as cars and 4×4’s to building products, to washing machines and smaller items like frozen pizzas and Sao biscuits. The Aranui 5 is 126 metres long, with a cruising speed of 15 knots. The cabins are located between midships and the stern with all the freight located in the bow of the ships. 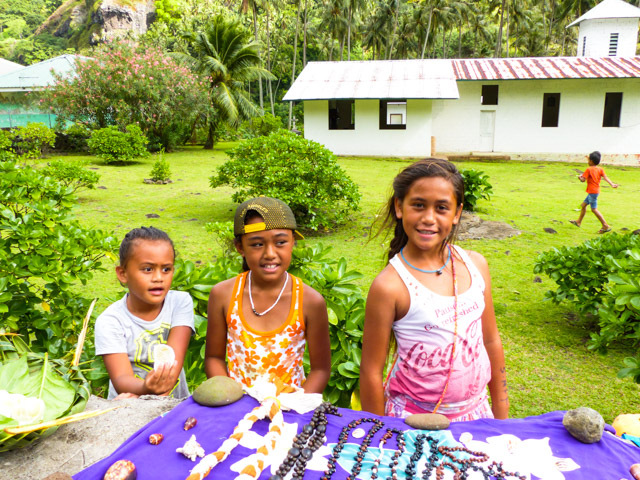 Each day we have a briefing about the next days activities which is comprised of lectures about the history of the area and the islands, what to do on Fakarava, diving, swimming (as it turns out you will be swimming with sharks), bike rides and churches. We also discuss seating at meal times and where to find happy hour and Tahitian dancing lessons. Fakarava is the second largest island of the Tuamotu Islands, one of the 76 low islands or motus in this archipelago. These motus have the sandy beaches and swaying palm trees that inhabit our dreams. We arrive on Sunday, so most of what you hear is song, coming from our welcome and the churches we pass by as we explore the island. See their hats and crowns of flowers, we asked how long it would take to make a crown of woven flowers, the smiling answer was less than 30 minutes. We walked around the island, many people were in church and finally we found a spot with wifi and a view. 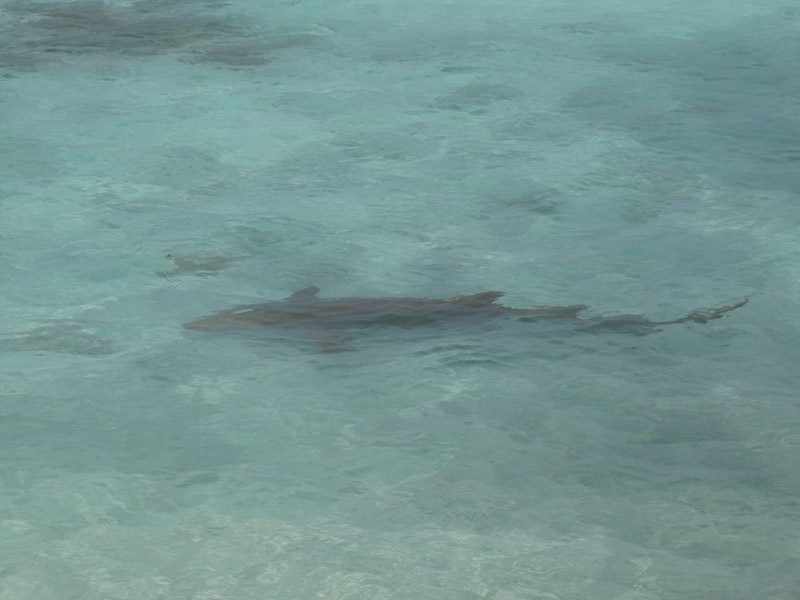 We had thought about swimming but when I walked over to the water, I could see a small black tipped reef shark cruising the edge of the bay. You also should be wary of falling coconuts and stonefish, but at least we hadn’t been threatened with the dreadful nono’s. It is finally time to go back to the ship and in the quiet water it is easy to get on and off the ship. 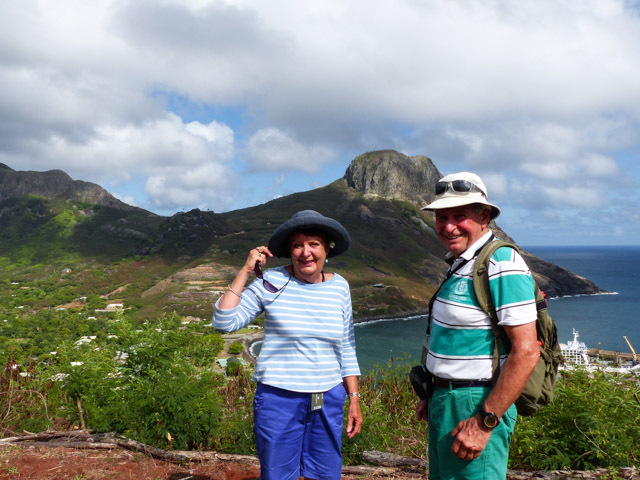 We are looking forward to our time on the Marquesas, as we are often the only tourists on the island. 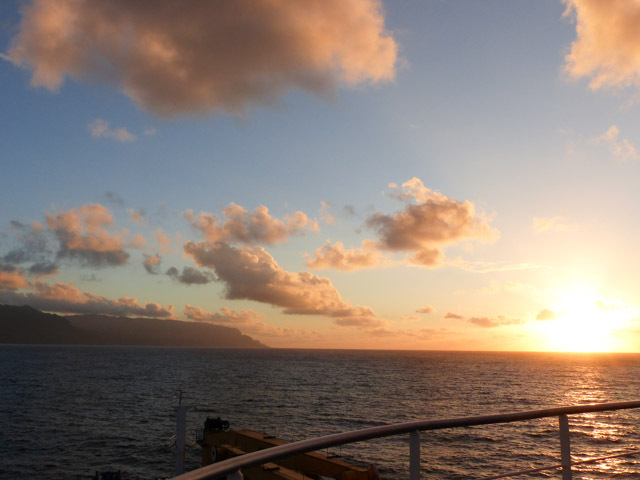 Onboard Aranui, we prepare for our first long sail out to the Marquesas Island. We go up to the deck on level 9 and watch the motus fade from sight. Tip: Don’t forget when packing: Sunscreen, insect repellent, Kwells or your favourite Mal de Mer remedy, water shoes and several bathing suits.